We read a lot of books in our house. Some of them for pleasure, some of them for school, some out loud and other we enjoy all to ourselves. In order for my girls to get the most out of what they read we like to use a literature study and lately we have been using Lightning Literature & Composition from Hewitt Homeschooling. We received the Lightning Literature & Composition: Grade 8 Teacher's Guide, the Lightning Literature & Composition: Grade 8 Student's Guide, and the Lightning Literature & Composition: Grade 8 Workbook. The 8th grade course is recommended for student's in the 8th or 9th grade and should cover one school year. It is available to purchase individually or in a set with some or all the required reading books. It is divided into 12 chapters and uses the books Stories & Poems for Extremely Intelligent Children, Treasure Island, A Day of Pleasure, A Christmas Carol, The Hobbit, My Family and Other Animals, and To Kill a Mockingbird. Literary Lesson ~ This section covers things like character development, symbolism, vivid imagery in poetry, humor, meter, and more. There are things your student may have trouble with listed or things to look for as your student works on this section. Mini-Lesson ~ These are also different with each chapter. Some of the topics covered are the narrator, fun poems, citing sources in a paper, and more. Introduction ~ The introduction is about the author of the selected title for the chapter. While You Read ~ Here the student is given things that they can think about or notice while they are reading the story. Vocabulary List ~ Is a list of vocabulary words, but may not include all vocabulary that the students needs to work on. Some vocabulary are divided into chapters or the entire selection. Comprehension Questions ~ Some of the questions are multiple choice, short answer, or long answers. Literary Lesson ~ The lessons are explained in detail to help the student really understand what they are learning. Mini-Lesson ~ These lessons have the student rewriting selections, citing sources, some grammar, genre, bibliography, and so much more. Writing Exercises ~ the writing exercises have the students describing, analyzing, symbolizing, and more. The Lightning Literature & Composition: Grade 8 Workbook is 288 pages and is available for $25.00. There are several worksheets that go with each chapter. It includes writing, grammar, note taking, crossword puzzles, word searches, writing acrostics, multiple choice, fill in the blank, and more. This Literature course starts with a short story called A Crazy Tale from the book Stories and Poems for Extremely Intelligent Children of All Ages. I really like the book selection for this literature guide. We already owned a couple of them either the actual book or we found some digital books free online or you could check your local library. I did have to purchase a couple of them including the Stories and Poems, but they were very reasonably priced. I really like that they start off with a short story. I think it helps the student get into the routine of the guide sooner than if they read a long book right off. We actually worked through this first one together so Amber (age 13) and I could both get a feel for how this would work and then she was on her own. Each chapter takes different amounts of time to complete depending on how long the book is. I like that Amber is learning and being challenged. She sometimes gets in a hurry when she reads to see how the story ends and this forces her to pay attention to things while she is reading. For example the While You Read section for Treasure Island suggests enjoying the book, but pay close attention to the description of the island and the ship. She did actually stop to think about them and then she would share with us. There is a lot of writing and answering questions, so we chose to answer some of the questions aloud. This also gave us the opportunity to discuss the book in more detail because I could draw more in depth answers from her. 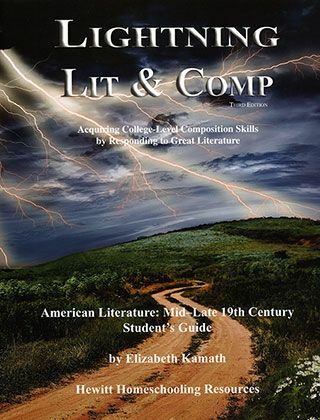 Lightning Literature & Composition is very thorough, but easy to understand and would make a great addition to any homeschool. Hewitt Homeschooling offers literature resources for Elementary, Junior High, and High School students. We had the opportunity to review Lightning Literature & Composition Grade 7 a couple of years ago, so I knew we wanted to review another level from them. Members of the HomeSchool Reveiw Crew reviewed different levels this time and you can check those out by clicking the banner below.